As a matter of fact, when Arnold got into eBikes, he also set up a $1500 rebate for the purchase of new electric motorcycles. But that is California. 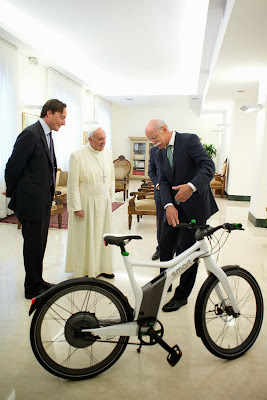 Back in July the Pope got an electric bicycle. In this picture Dr Dieter Zetsche, Chair of the Board of Mercedes Benz, is handing over the keys to a Daimler Smart eBike. The Transportation Expo in Hanover on November 16 was a lot of fun. Sustainable Hanover arranged to use the Richard Black Community Center for Saturday morning, and had several electric and hybrid cars out in the parking lot, as well as organizations like Advance Transit, Hanover Bicycle and Pedestrian committee, Upper Valley Trails Alliance, and several bikeshops, in the building. I thought it was great because I finally got to meet Larry Gilbert of Zoombikes and try out an Evelo ebike. 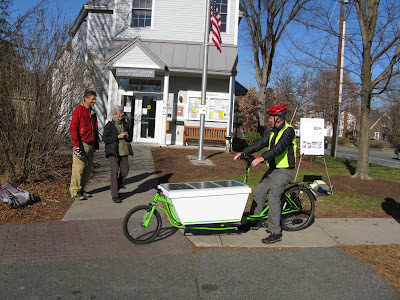 There was good crowd, and another half dozen people took test rides on the solar electric cargo bike. The temperature was a little cool at the start, but quickly warmed up under a clear blue sky, a great day for test bike rides. 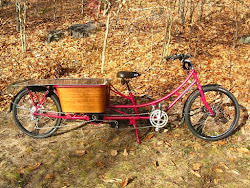 Larry had both regular style electric bikes, and a trailer with an electric motor for pushing a bike along. Hoyt Alverson brought his homemade ebike that had extra towing power, and the solar electric cargo bike held down the utility commuting side of things. The parking lot had Toyota, Nissan, Ford, Chevy, and two Tesla electric vehicles for people to look at. 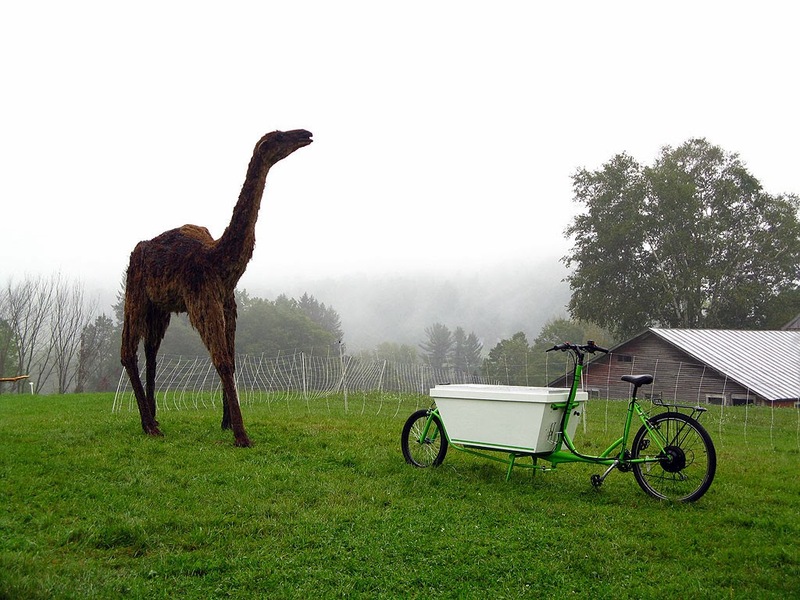 Riders were eagerly waiting for test rides on the solar electric cargo bike. The usual result of a test ride- a big grin. A test rider pausing to talk with friends before a test ride around the block. It does point out the quantity of energy that a bicycle uses is on the small end of the scale, and small changes can make a difference. The mpg should be more like 2500, must be going up a hill. 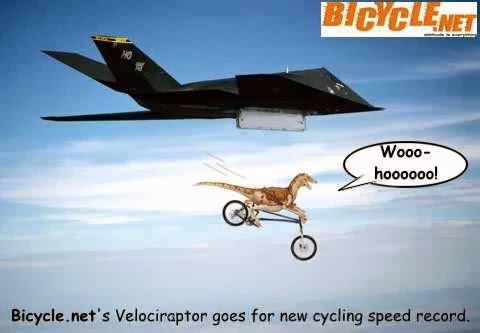 To put things in overall perspective, the simple kinetic energy equation: Energy = half of mass times velocity squared, (E=0.5mv2), can be used to compare a bike and a car. Stopping the car yields 45 times as much energy. The question becomes, "Does the small amount of energy from bicycle regen matter, compared to other energy flows of the bike? 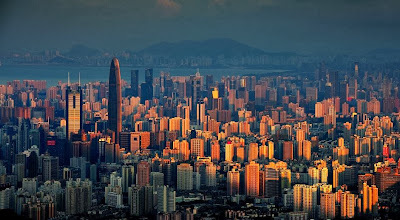 -Terrain will affect regen, because long, medium descents will yield the greatest regen, full stops that are more common to flat areas are not as effective, and steep descents that dump energy will actually cause a loss. Parasitic motor drag is a special situation. 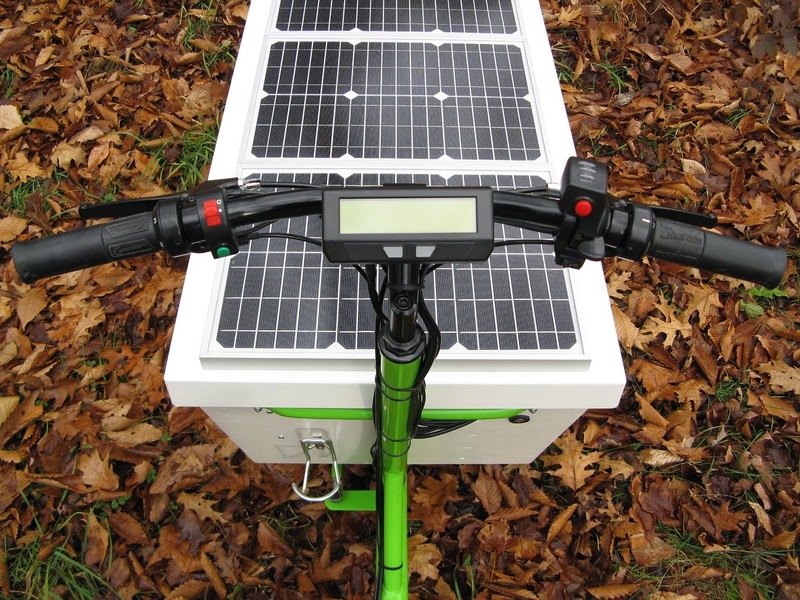 Regen on bikes is done by electrically switching the permanent magnet motor to run as a generator. 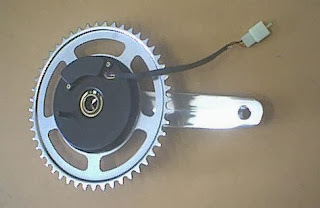 The motor has to be directly connected to the wheel, if there is a one way slip clutch to allow coasting, the wheel can not drive the motor for regen. The problem is that the magnets are attracted to the steel motor poles, and without power applied they resist moving from one pole to the next. If you have ever turned a stepper motor (such as on a computer printer paper carriage), you've felt the cogging as the magnets moved from pole to pole. This drag on a direct drive ebike, when the power is turned off, feels like riding with a soft tire. In a car this doesn't matter, as the baseline drag loads are large enough that a motor has to be powering the car all the time (except during braking). However bikes spend a lot of time coasting with no motor on, they have a state in between the motor being on, and motor regen, that helps make them very efficient. An ebike direct drive motor can be turned on slightly to give the illusion of coasting, but does the regen energy make up for this loss? In Vermont most roads run along valley floors, with a long steep climb and then a long descent to get from one valley road to the next. I would love to have regen instead of having to hold the brakes during the descents, would this make regen viable? Would local urban use in WRJ be different? Since there are so many variables, the easy answer will be simply comparing the Watt hours per mile of the second bike that has the direct drive motor with regen next summer, versus the Wh/m of the Bakfiets without regen from last summer. 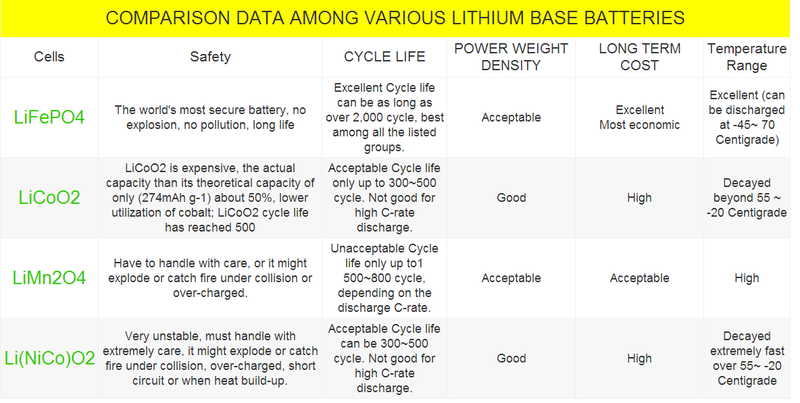 An even closer comparison will also be possible using data from the Cycle Analyst data logger on trip sections. This meant my dog could no longer ride unless I unscrewed the hinges, but it has turned out that I wanted the lid for most trips anyhow, for both PV power and load protection (from the wind at 35 mph, and occasional rain). The only time the load has gotten wet was once when I didn't screw my water bottle lid on tight and put it inside the box. Then I found out how watertight the box is. 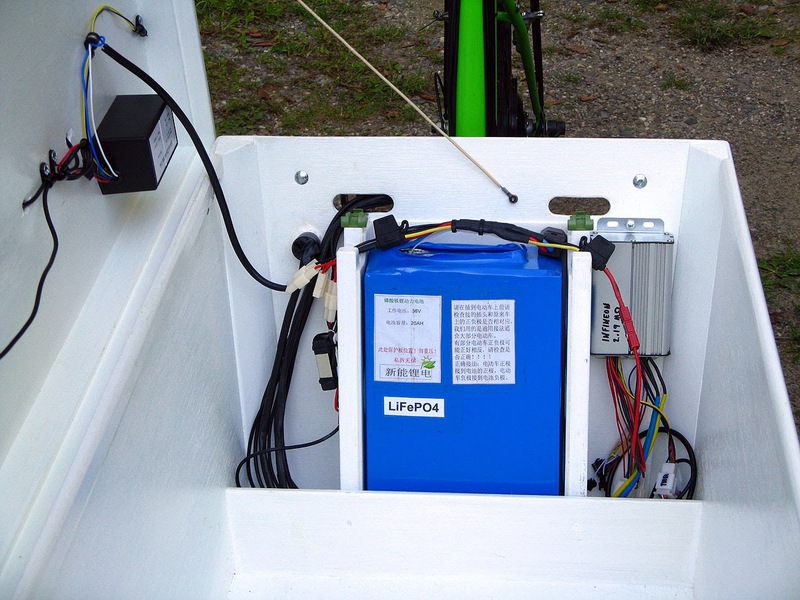 On the lid at left is the controller for the solar panels, and the left back wall has an ignition key and a dc to dc converter for the lights (both hard to see in this photo), the blue battery is in the center, and the motor controller is on the right. It's good to have the controller mounted in a protected open area, as it does get warm and needs air circulation around it, however I've also seen two controllers that were mounted outside which short circuited when rain got inside them. The slots in the back wall are for seatbelt loops for use with a child seat. If I were to build this bike again, one of the changes would be shortening the box by 7 to 8 inches, so that it would fit just the battery and two buckets. It has been more than large enough for carrying groceries and recycling. 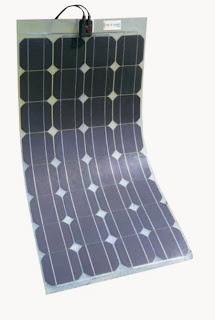 Another change would be to use a monocrystalline cell frameless and glassless solar panel as the lid. 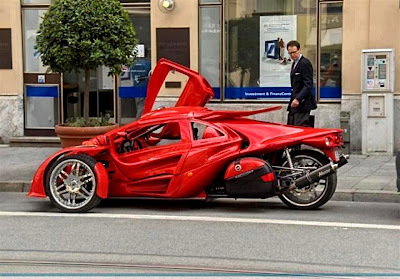 The two modifications together should lighten the bike by 20 pounds, (although also be a lot more expensive). I've just been asked about the FlyKly again, (I think their search engine optimization people are working overtime), and thought a post about it might be appropriate. The FlyKly is a rear wheel replacement that has the batteries and motor built inside the hub, making it very easy to install- you simply replace your bike's old rear wheel with it. There is no wiring or connections. When you brake going down a hill it charges the batteries, and as you pedal going up a hill it automatically turns the motor on. Easy installation, easy riding. It is very similar to MIT's Copenhagen wheel, which should have been on the market by now because they had a couple year lead on the FlyKly. They licensed it to Ducati in Italy. The devil can be in the details. The motor fits in one side of the hub limiting it's size, they state it is 250 watts. For comparison, most ebike kits on the internet have a 300-500 watt motor, and the battery packs are about 36 volts x 9 amp hours, or 324 watt hours. 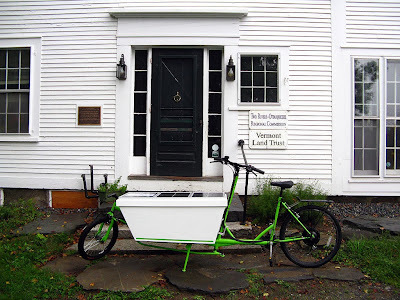 My Bakfiets solar electric cargo bike was designed to carry loads, and has a motor running at 500 watts, with 720 watt hours of battery capacity. "Smart bike has taken a big step into the electric bike market and "looks" to be trying to hit it out of the park with it's line of new ebikes. However because they have chosen a 250 watt hub motor, their attempt looks like it will be more like a bunt-dash to first base rather than a home run." A further indication that the FlyKly is lighter duty is that they do not have a torque arm on the spindle of the hub, and rely only on the slots of the drop out to keep the axle from spinning. Most riders should expect to get the majority of energy into the FlyKly batteries from plugging it into the wall, and then because the batteries have at most a 200 watt hour capacity, to have a limited to medium range (depending on individual circumstances). A further complication is that regeneration will only work with a motor that is constantly engaged, there can't be any slip clutches that allow coasting. The problem with direct drive bike motors is that the permanent magnets are constantly attracted to the steel poles for the windings, and this causes a slight drag when turning the motor, like riding with a soft tire. If you have ever turned a stepper motor, (commonly used in computer printers, mechanical control systems, and small industrial drives), by hand, you have felt the cogging as the magnets jump from one pole to the next. 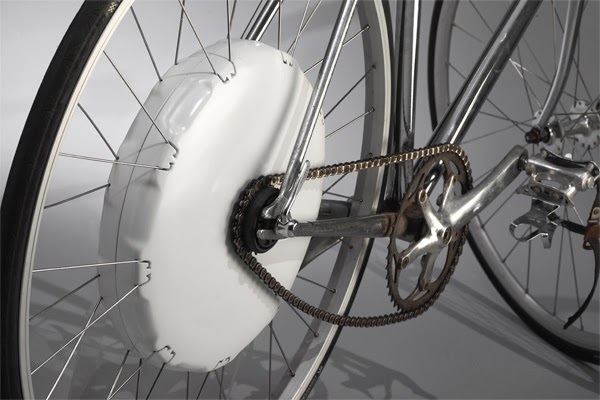 The result is that you cannot truly coast with a direct drive motor, when a rider stops pedaling there is a slight drag slowing the bike down. A compromise is designing the system to have the motor turned on slightly to give the illusion of coasting, but this becomes a tradeoff between range and whatever regeneration might be produced. -Most bikes nowadays are not designed to adjust chain tension, that function being taken over by the derailleur mechanism. In most cases the FlyKly chain will simply have a large droop and a lot of free play in the pedals, but in the worst case the chain may slip. -Wifi or Bluetooth communications generally have a range of 300 feet under perfect conditions, and 100 feet or less under real world conditions. This may affect the security functions of the FlyKly. With the understanding of these FlyKly limitations I would still say there is a market for it, just don't expect it to haul loads up a hill. 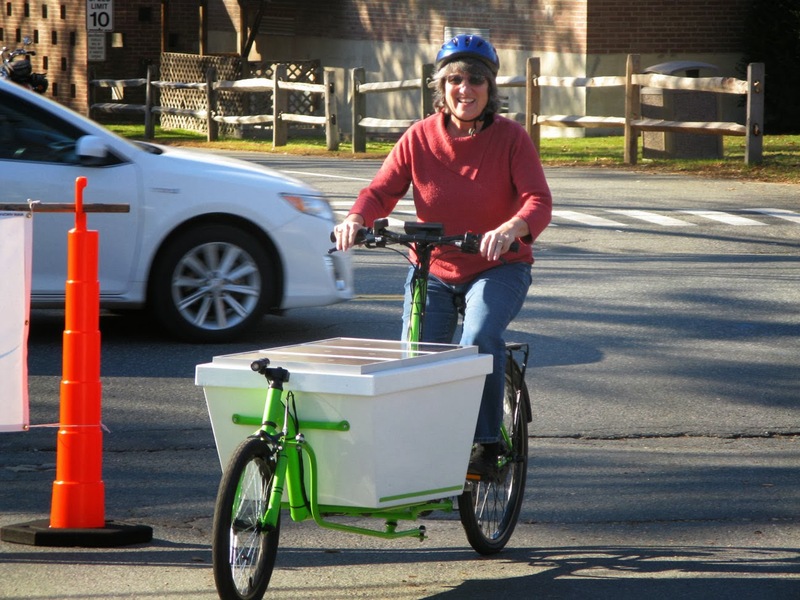 If you are a lightly loaded bicyclist, who has a mainly level route, that is medium distance or less, and needs just a little extra help getting up that hill or two, this might be an easy to use solution for you. Bicycle frames have evolved over 200 years, and there isn't much I'm going to do in my workshop to improve them. A thin wall steel tube frame is probably the best choice for a cargo bike anyhow, as it won't fracture or splinter like carbon or wood when the bike gets dropped down some stairs, and is more easily repairable or modified than aluminum. (I've seen projects that I've built a year or two after they were finished, and sometimes I've wondered "How on earth did this happen???") Steel can take some abuse, which is good for a working bike that is carrying someone at 20 mph with no routine maintenance plan. In general the walls of the bike frames I cut apart were about 1/16" thickness (0.060"), and they had a bead running down the inside of the seam, so they were not Drawn Over Mandrel (DOM). Many bike frames are made of chrome moly (CrMo) steel, which is stronger than more common carbon steel. (The tensile/yield properties for CrMo are around 70,000 to 85,000 psi, whereas 1020 is more like 45,000 to 60,000.) However CrMo is slightly more likely to crack around welds, and isn't as workable. So I used a good carbon steel and sized the tube slightly larger to make up for the psi. 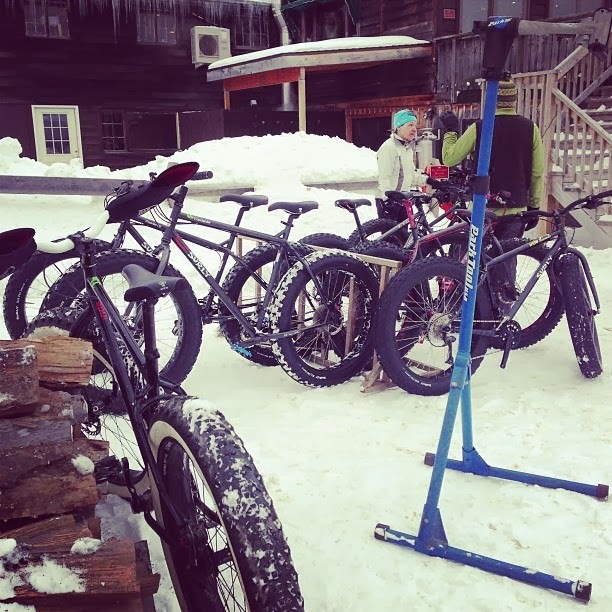 It's a few ounces heavier, which will be more of a concern several bikes from now. One of the nice things about making a frame is that it can be made to suit the job better. For example I used a 69 degree angle on the front fork stem, which gives slightly slower steering than most bikes, making the cargo bike more stable. Also I dropped the crank as far as possible, to make it easier for riders to step through, or to stop and stand at an intersection. MIG welding was used, which is not as pretty as TIG, but still serviceable. My opinion here (Warning!) is that since abrupt changes in section create stress risers, the many ridges going across a TIG weld aren't as good as a smoother MIG weld, and the reason why either works is because the root section is so thick the stress risers don't matter. 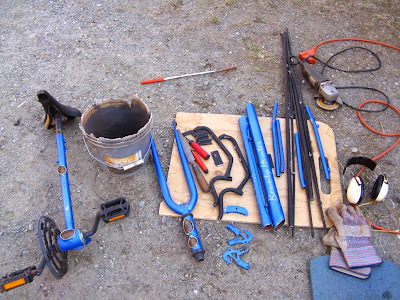 I'm off grid, and the welding was solar powered. The finished frame getting a coat of paint. -A good primer coat is needed or the steel will rust and turn the paint brown. -Good prep work is needed for a good primer coat. -It takes at least two months to dry. The frame can be worked on the next day if you treat it very, very carefully, but it won't be hard. -As it dries the brush strokes flatten out, and well brushed sections can turn out like automotive paint. I'm planning on continuing to use paint like this, and improve the application technique. A further experiment will be a clear topcoat, but that will require scheduling so that the first coat can dry thoroughly. 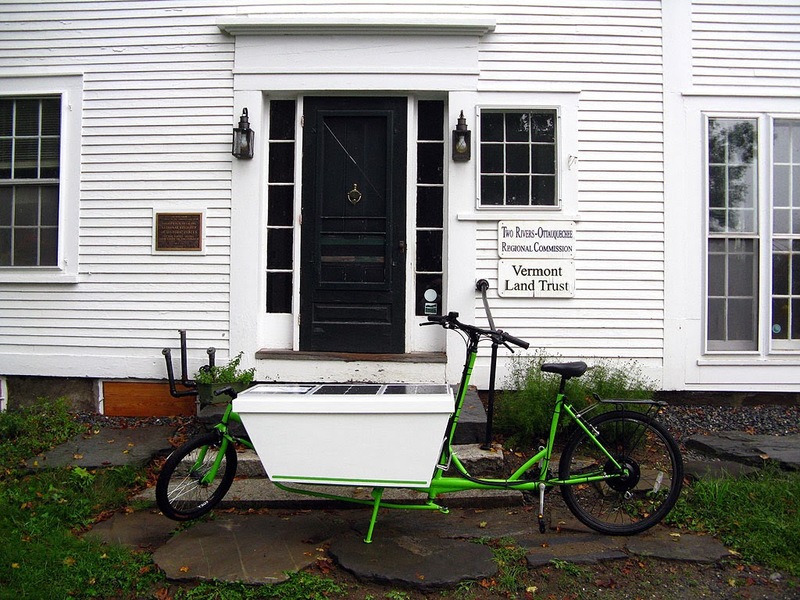 Yesterday I had the honor of giving a presentation about the Solar Electric Cargo Bike to the Transportation committee of my Regional Planning Commission. I summarized the main points of the bike, which are written about in more depth in this blog, so I won't repeat the presentation here. 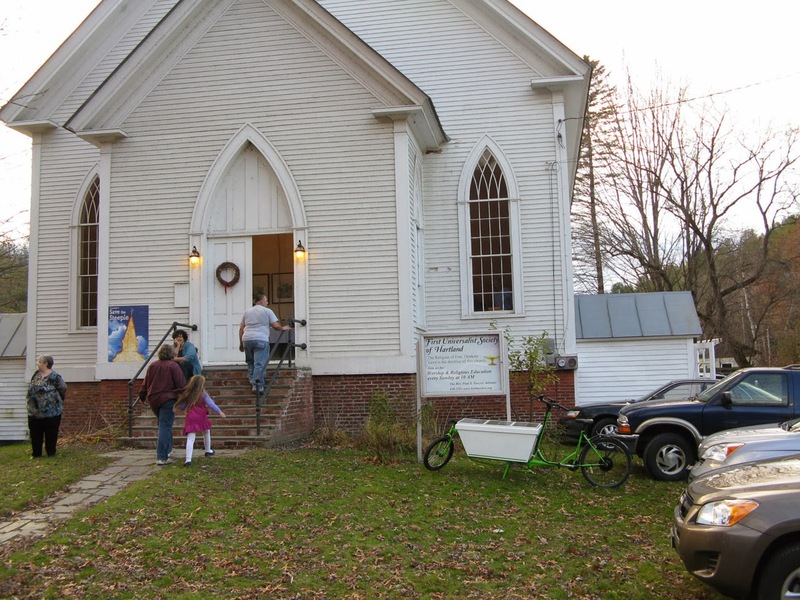 The other speaker was Gina Campoli, of the Vermont Agency of Transportation, giving far too short of a talk about Electric Vehicles in the state. She highlighted the state's current population of cars, (5 of the top 7 most popular new cars are pickup trucks), and what this means for our state's Green House Gas emissions and fuel use. The rural character of our state also puts us up close to the lead in Vehicle Miles Driven per capita. 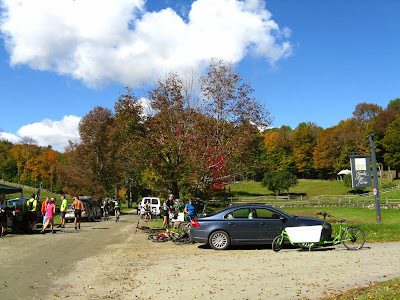 There were 7.141 billion miles driven in Vermont in 2011, or 11,400 per capita, which is 20% above the national average. People may have a very efficient house, but then because of our rural nature, have to drive out from it on average 7 times a day. 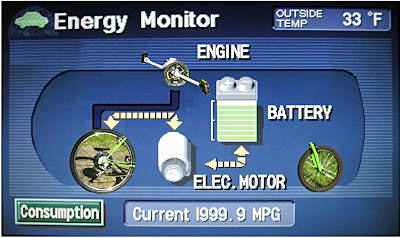 One of four methods of dealing with this is by switching to Electric Vehicles, (the others are improved vehicles, reducing vehicle miles traveled, and improving vehicle system operations). Buses would come under reducing VMT, but unfortunately a housing density of at least 5 units per acre is needed to support bus service at 5 to 15 minute intervals. 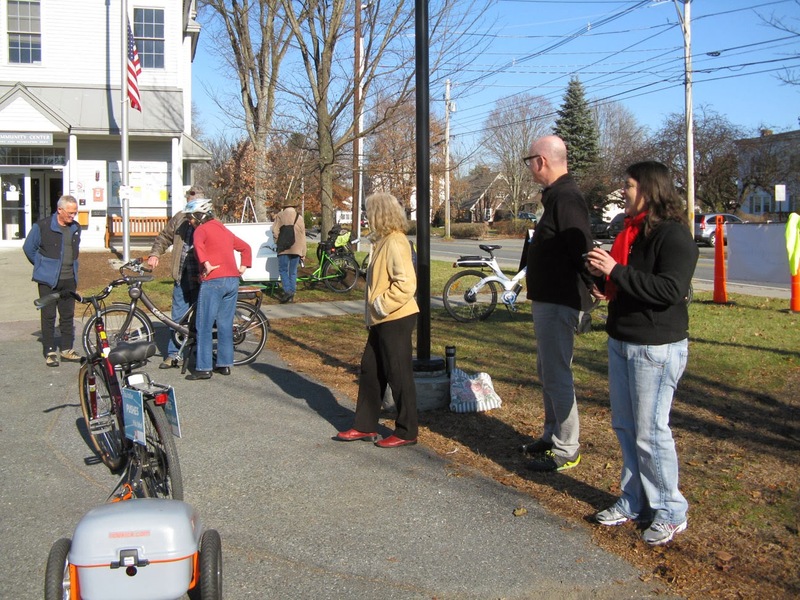 Gina then covered the state EV public charging stations program, and the EV highway from Montreal to Montpelier. 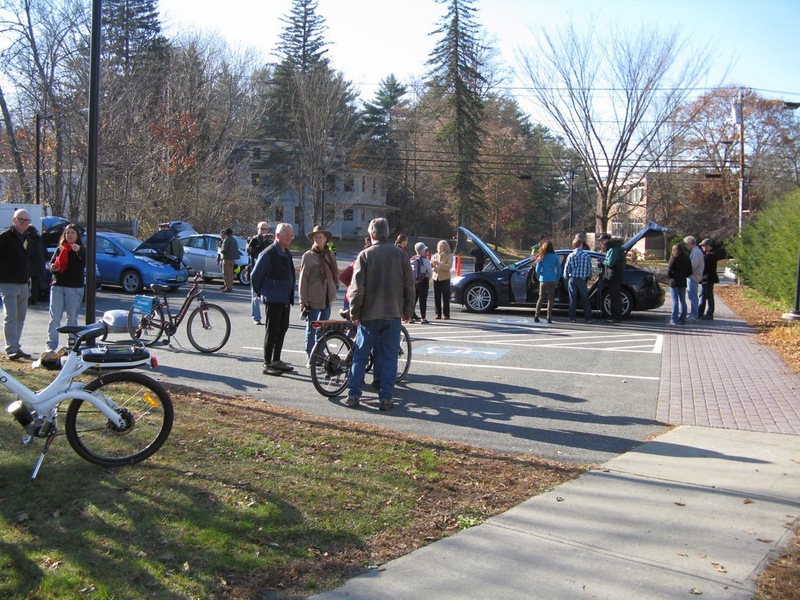 Drive Electric Vermont, (a part of VEIC, a link is in the sidebar), is working on the logistics of this program, mapping the public charging stations and aiding the installation of new ones. The EV highway is also actively being promoted by the business community, as charging stations will attract drivers, who will stop and spend time in an area. One problem appearing is that as Vermonters use less fossil fuel, the gas tax funds for maintaining the roads will shrink. Another loss of funds is the national trend that registrations have started to decline, particularly among young people. 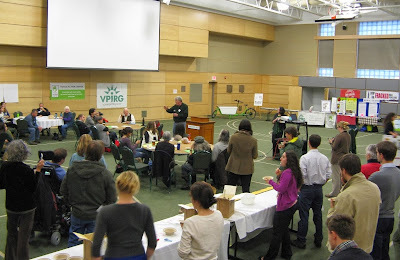 At the VT Toxics Action conference last week, a young woman told me that she and her husband live in Boston and use their bikes for all transportation other than long distance, for which they regretfully own a car. Also, I noticed that when I gave my talk about the bike that several young people from the Regional Planning Commission dropped in to listen. The RPC is only 9 miles away from my house, but the route goes over a mountain with about 700 feet elevation change in a little over a mile. On the way home I walked up that section, with the bike motor turned on low pushing the bike along for me. This increased the average power use to 18.2 Watt hours per mile, and dropped the trip's average mpg to 1850, and average speed to 11.9 mph. It made me wonder if a mid drive motor might be better for Vermont, because the bike motor would have more leverage from being shifted down to the slower gears. Or do I just need more power? 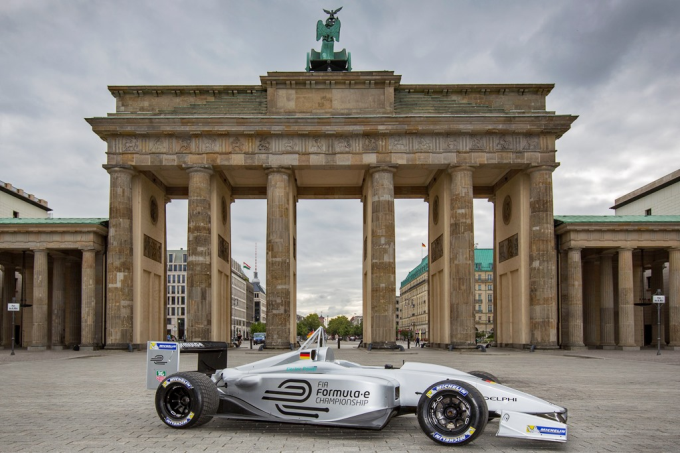 Berlin will be the site of one of the 2014 Formula E races ( http://www.formulaeracing.com/ ), along with Los Angeles and Miami. Judging from the YouTube videos, Formula E cars do make noise, mostly from the gears and smoking tires. 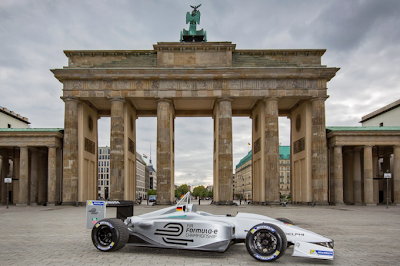 Perhaps they will use some of Berlin's 220 public charging stations for the pit stops, with the race cars waiting in line with the city's electric police patrol cars? Going back over this blog while talking with a few people about the solar electric cargo bike, it is a bit out of order. I started with a general view, and progressed to individual components. The more detailed posts are great if you are thinking about trying to build your own bike, but if you are thinking just about riding one, or complete streets, go to the beginning posts (and also some future posts will be summaries). There are another half dozen posts planned as time permits, if you have a specific question send me an email and I will write about it sooner. 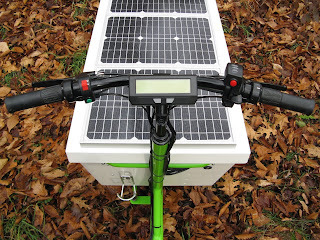 There was a good chance that solar panels might not work on a bike, because of shading from trees and being in valleys. My first estimate was that the panels might produce 1/5 to 1/6 of the power needed if everything went right, enough to extend the range of the bike, but not enough to run on. It has turned out that it all depends.... (mostly on shading), and actual performance will most likely be a bit better. The lithium battery has a specific charging profile, so to make it easier to modify if it wasn't working right I chose the simplest and cheapest route, wiring the panels in series. 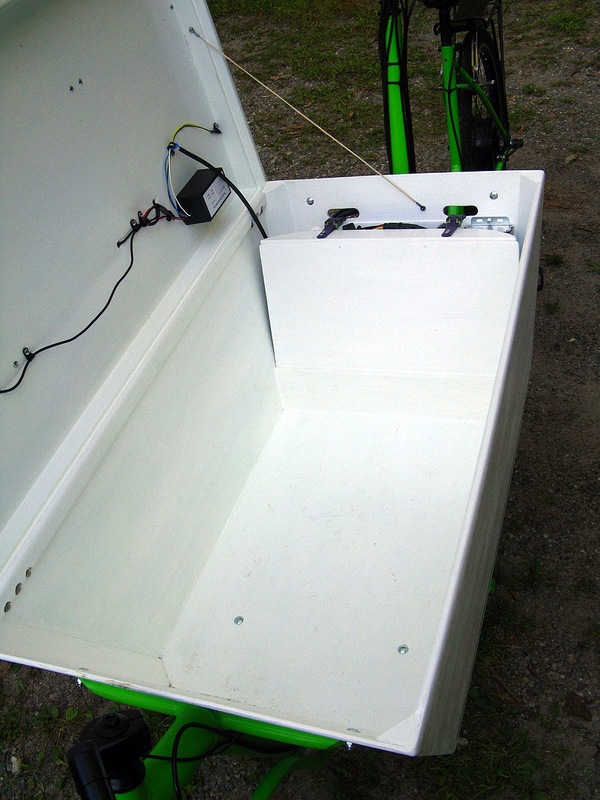 The available area for this bike's design was limited to the top of the cargo box. The panels are controlled by a Solar Controllers Inc. 36 volt MPPT controller, and there is some interaction between this Solar Controller and the Battery Management System circuit, such that there is some energy not being used. 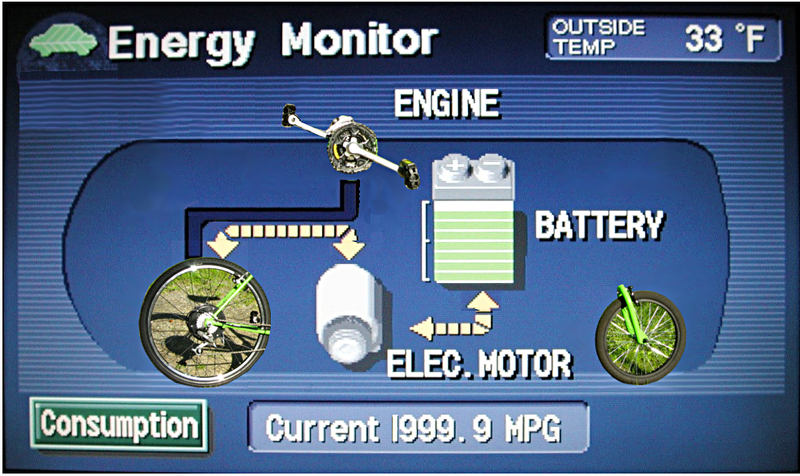 It is probably not much, as the controller is meant for a mobile golf cart application, and both the Solar Controller and BMS have 42V setpoints. 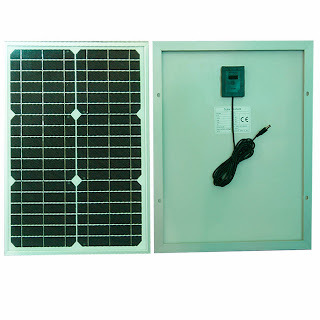 To verify the solar panel contribution, I need to wire a shunt into the panel output and connect it to the data logger, this is ongoing. I will write more about this in a future post about the Cycle Analyst and data collection. There are several improvements that could be had by going to a 48V system on the next bike, but it appears that costs will also at least double due to a more sophisticated system. When the design is worked out I will put up another post. Likewise, some significant benefits could be had by going to frameless and glassless mobile application solar panels, (estimated 18 pounds of weight savings), but they would cost about 4 times as much. 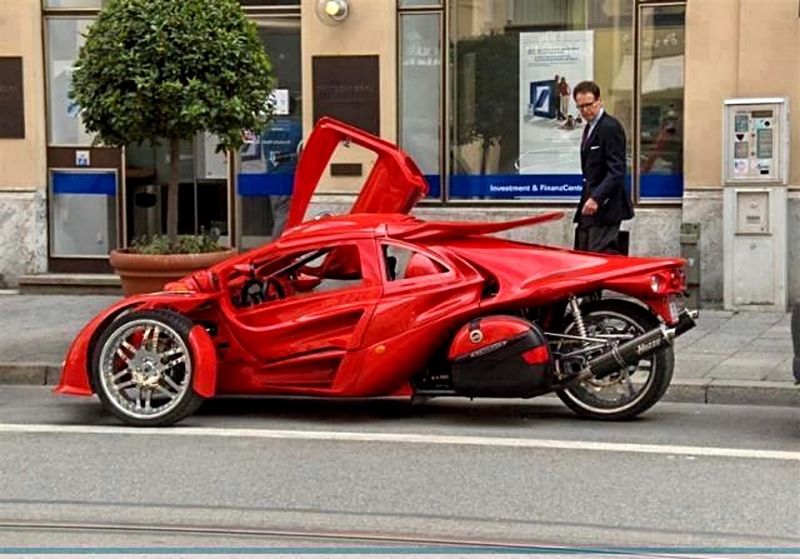 The market is changing, so this may work out to be a near term option for the second bike. 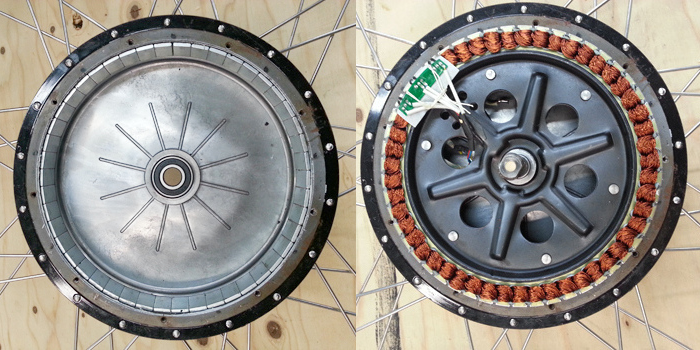 The long term (14 trips) average energy usage of the motor (any time the wheels are turning), is 195.36 watts. Using the estimate of 52.8 watts for panel output, the motor to generation watts is about a 4:1 ratio. Again, until the shunt is installed on the panels, and some time is spent analyzing the results, I won't have a shading factor for Vermont roads. It can be estimated simply by looking down a road and seeing how much of the pavement has a shadow on it, but this is not as accurate as long term measurements would be. For now I am using the simple equation that if you ride for half an hour, then park in the sun at your destination for 2 hours, (4 times as long), it will charge the battery back up. At the beginning of the project, I planned on using an old car battery that I had in the barn. It would have saved me a lot of money, but it would have been the death of the project. At first the low budget route seemed good, reusing something I already had. But after reading some mileage claims, I decided the bike needed a fair amount of energy to get to WRJ and back, (33 miles with no side trips). The old car battery might have had maybe 300 watt hours capacity left in it, and besides it was only 12 volts- the motor needed 36 or 48. As previously mentioned, Amps is like the water flowing through a pipe, and Volts is the pressure (zing) pushing the water. The two have to be combined to get the total amount of power, and this is done by simply multiplying them together to get watts. If I let 20 amps of electrons flow out of a 12 volt battery, there is 240 watts of power flowing. If the battery produces that flow for an hour, (this changes the flow into a fixed quantity), the amount of energy produced is 240 watt hours. The more the volts, the more the amps, and the longer the time the battery lasts, the more capacity it has. The nice battery pack in an aluminum case under a bike luggage rack that I mentioned while talking about range is probably 36 volts x 9 amp hours, or 324 watt hours. I wanted more. 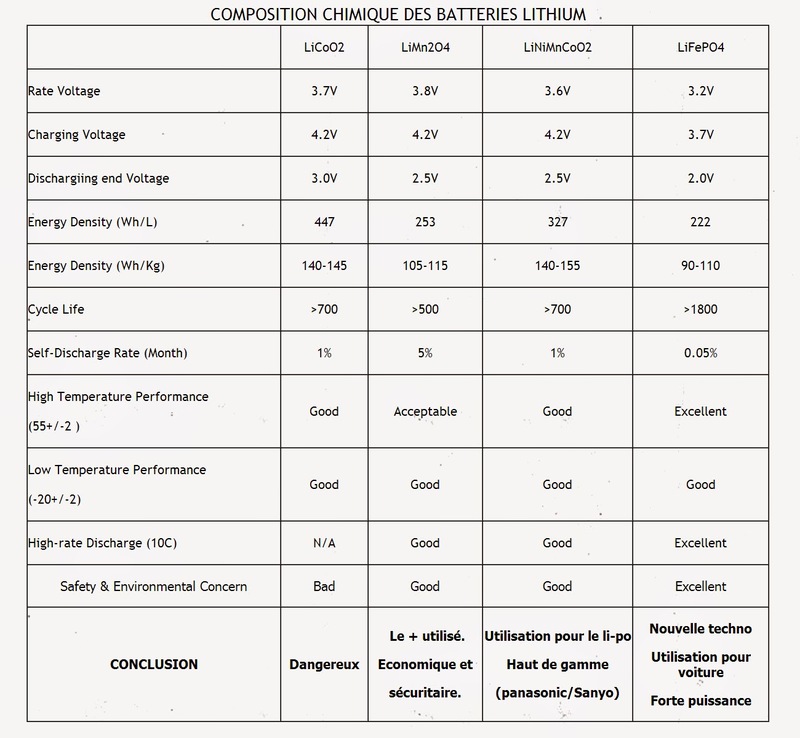 Lead acid batteries (like my old car one) have a few problems. They are heavy (like lead), spill sulfuric acid, and don't like being drained below half full (they die). Golf carts use deep discharge cycle versions because they are cheaper than other batteries, and it is ok to carry around 250 pounds of batteries under their seat. 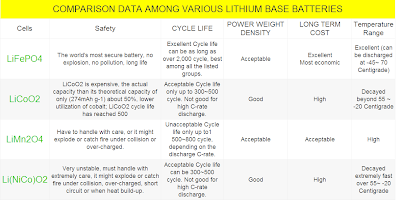 A sealed lead acid battery prevents spilling acid, but still dies if discharged too much. The consensus on most forums about lead acids was that they last only one year, because no one stops themselves from draining it all the way to empty. At a Lead acid battery a year, a lithium battery that lasted 3 years would actually be cheaper, and not have the draining problem. You will notice that I've jumped over NiCad and NiMh batteries. NiCads are quite toxic, have a memory, and don't come in big assemblies. 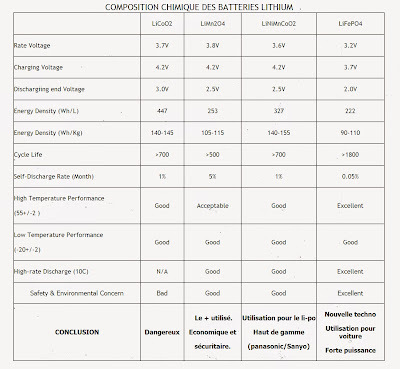 NiMh are better, but why not just go to Lithiums? While a cylindrical cell allows air to flow through a stack for cooling, (good for preventing Priuses from catching on fire), the LiFePO4 chemistry doesn't really need it. The Prismatic Pouch cell takes less space on a bike, and is lighter. In addition, they are actually connected to the US, as A123 is from Massachusetts, (although the cells in my battery probably came from a plant in Korea). 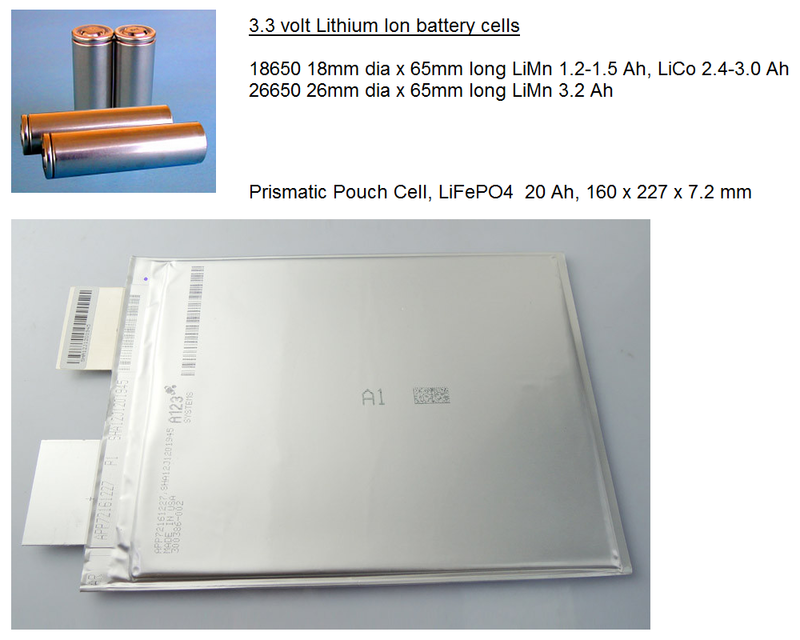 A further feature is that LiFePO4 is similar to the naturally occurring mineral Olivine, and is relatively low toxicity. 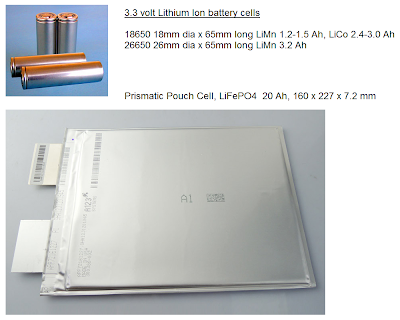 The Prismatic Pouch cell comes in a 20 Amp hour size, and assembling them in series with a battery cell monitoring circuit for a nominal 36 volt battery gives 720 watt hours of capacity. The battery has foil faced foam board sides held together by blue heat shrink tubing. This is a step up from the cardboard and duct tape wrapping that many cylindrical cell battery manufacturers use. It has worked very well for about 450 miles this summer and fall, and the only bad comment is that the charger was squashed during shipping, and I had to pay $25 more and wait 4 weeks for a replacement before I could charge and use the battery. 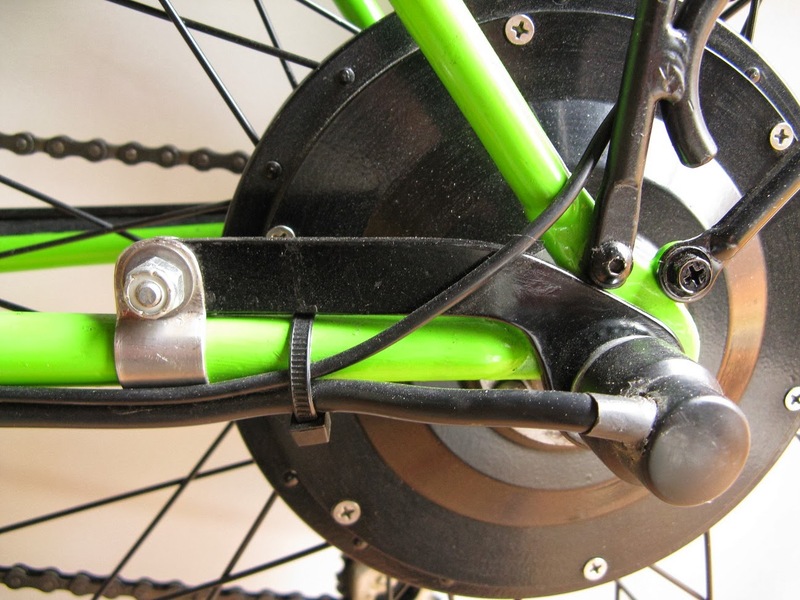 A lot of bikes have a front wheel motor, as it doesn't involve the freewheel and chain. However the rear triangle of a bike frame is much more solid than a front fork, and since the cargo bike design included carrying loads, I choose a rear motor. A secondary factor is that many of my roads are dirt and sometimes steep, and I expected a front wheel motor to be more likely to spin. (There are bikes with a motor on each wheel for all wheel drive.) A note: both locations need a torque arm, especially aluminum front forks, unless you have a very small motor that you never turn on full. Torque arm (black metal piece from axle to frame) that stops axle from spinning in dropout. A geared motor has a smaller hub inside it carrying the magnets, which spins much faster than the wheel. Then gears slow down the motor speed to the wheel speed, giving a lot of torque at low speeds. 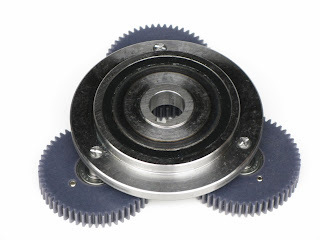 However the gears would make coasting next to impossible, so a one way slip clutch is added. This allows coasting like a regular bike, but does not allow any regeneration on braking. One way slip clutch in center, with 3 planetary gears riding on it. The motor gear fits in the center of them, and the outer ring gear is on the bicycle wheel inside where the spokes attach. Direct Drive lets the motor function backwards as a generator, and pump electricity back (Regen) into the battery when going down hills. There is not much energy available on a bike from doing this, I'll cover it more in a Regeneration post. Also the magnets are constantly attracted to the coils in the motor, and if the motor is not turned on it is harder to pedal, like riding with a soft tire. 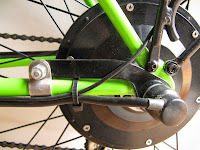 A Pedelec system turns the motor on only when the rider is pedaling, by using pressure sensors on the pedals or sprocket. Several European countries require this system. 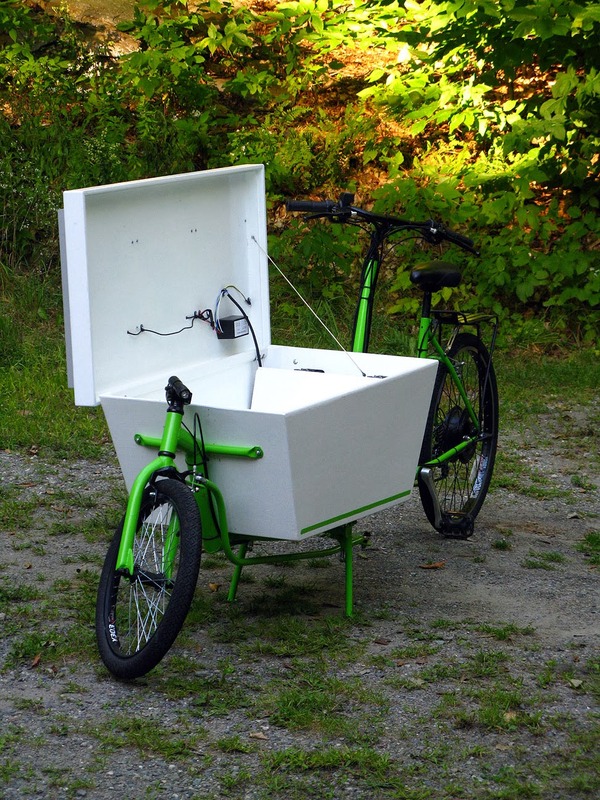 The solar electric cargo bike uses a hand throttle instead which allows riding without pedaling. However if done well, (such as Bionex), a Pedelec can be a lot of fun to ride with no constant control needed from the rider. It is also a natural fit with a mid drive system. I may have to build a fourth bike to test this out. The power section of this controller is rated for 52 V, so I could also use a 48 V battery pack. This controller is programmable, and I can set several operating parameters. The bike is currently set up as a 500 watt bike, (36 volts x 15 amps = 540 watts), and this is proving to be a decent amount of power for getting up hills. 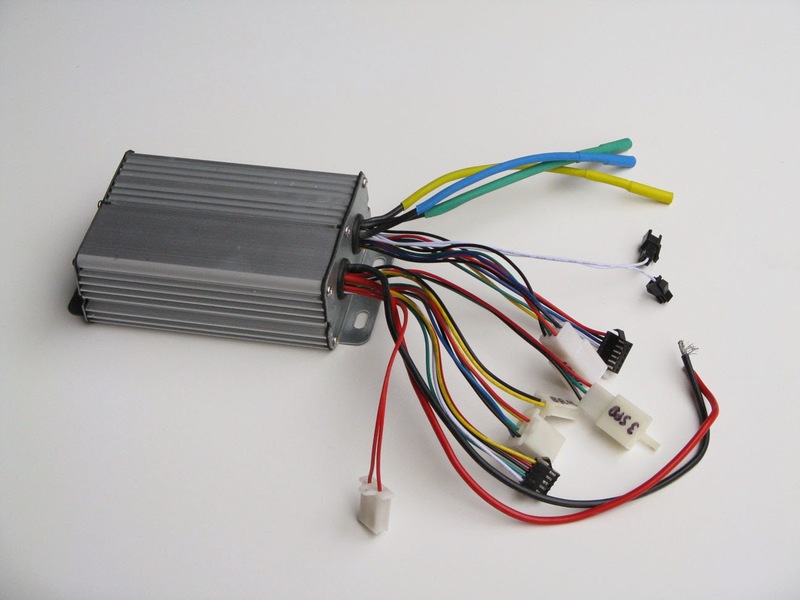 -The motors have the capacity to go up to 1000 watts under continuous use. Although only 300 W is needed on a flat road, I wasn't sure what would happen on hills with a loaded cargo box. This setup is medium heavy duty. If I was building a bike with no racks for around town use, one of the lighter kits on Ebay would probably be ok. 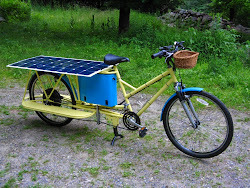 There are not very many solar electric cargo bicycles where I live. As I started to collect information about them the summer of 2012, I asked at bicycle shops between here and Montpelier, talked with other energy committee people who were Electric Vehicle enthusiasts, and asked Transition Town bicyclers. Entering that winter I had a list of 21 people who wanted to be involved in the project in some manner, with about half of them willing to be test riders for a week or two and write a report on whether they used the bike or their car and why. From the start there was a lot of interest, and it seemed like many people would be involved. There was also a definite scarcity of knowledge, so it seemed like these bikes might end up as a public education program, like Solar Hartland had been. About the same time, I started to become aware of how expensive this project might be. Since so many people were involved, I asked for permission to run it as a town energy committee project, and then applied for a $1000 grant to cover the batteries and some of a motor. 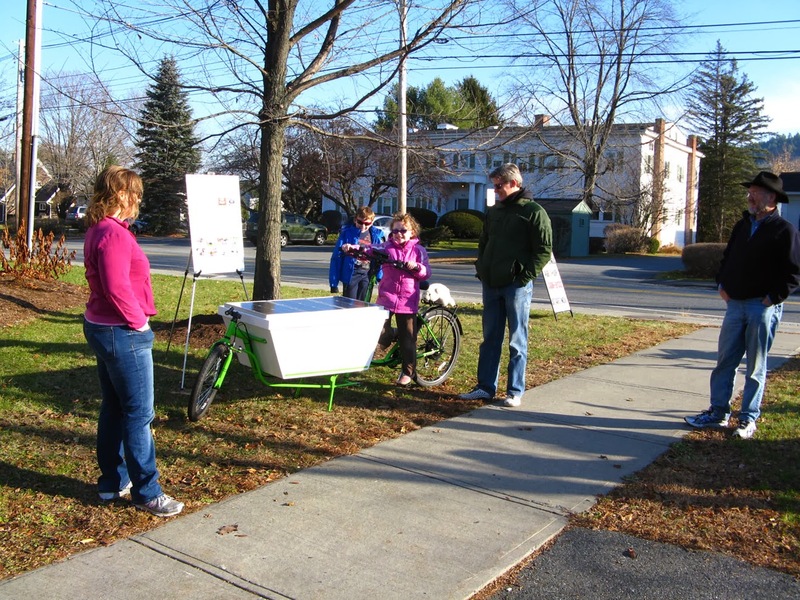 The precedent was a pair of Transition Town bicycle blenders that I had been loaning out to various community groups for the previous 5 years. The grant wasn't approved because they felt there wasn't enough community involvement, which turned out to be true: When I had to care for family members during the summer, Bob and Chad were able to do some of the welding, but without me designing the pieces the project slowed to a crawl. So I sucked it up and bought both motors, (it is always better to have the parts in hand for measurements when building a frame), and postponed the batteries for a few months. Ever take something apart and think "I'm not putting that back together again"? Unfortunately the battery was needed sooner than planned to finish up the frame dimensions, resulting in my skipping church donations, etc. for a while. The motors came from Hong Kong (the company was a delight to deal with), and the battery from Shenzhen (the company might have been ok, but the shipping company squashed the charger and things went downhill from there). I'll write more about this in upcoming motor and battery posts. Another item that didn't work out as planned was the parts bikes. Only about half of the parts were usable, and many shifter or other parts were unique to a manufacturer, so a lot of bikes were needed to get a whole bike. Also only about half the frame tubing could be reused, as many of the cut pieces were a few inches too short. It is necessary to put together one good bike, and then plan on purchasing new tubing and repair parts as needed to convert it. I had heard of them before (a local baker, Kelly, has adapted it to "Bread not Bombs") but wasn't familiar with them, so I looked them up on Wikipedia. They are in Boston, and have been around since 1984! https://bikesnotbombs.org/ I can only imagine how many used bikes they must have to go through to produce a shipment. 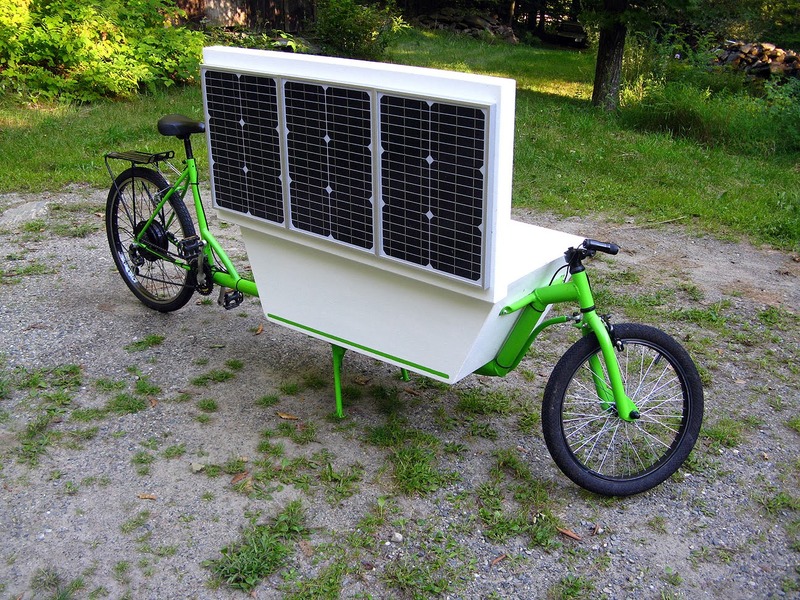 solar panel project on a tricycle is visible to the left of the cargo bike. Visiting "The Li of You and Me" community art show at the Library. Hanging out watching the bikers and runners at a water stop at the Vermont 50 mile race. 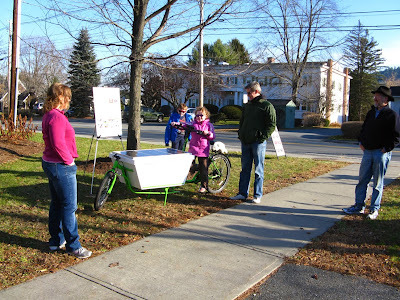 Test rides at the Hartland Farmers Market Fall Festival. There were many fun moments, like walking out of a regular supermarket, throwing the bags of groceries in the box, and riding off with shoppers looking on. About 50 to 60 people took test rides, and about a dozen times I heard riders say "WOOOOO" from a quarter of a mile away once they figured the bike out. If they didn't come back with a big grin, I knew they had missed turning on the motor somehow, and repeated the instructions and sent them back out again. There are other events and conferences still coming up this year, but because of the delayed building schedule the loan trials did not happen. I'm expecting the longtail will be done next summer, and once the second battery is purchased, the loan trials will take place.